January 2012: Tips, eNews and More! We hope you had a wonderful holiday season and are now relaxed, rested and ready to face 2012 head on. You can start by making your smile as best as it can be! You may request an appointment here. 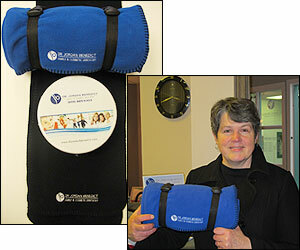 Congratulations to our draw winners Anne B, Lorne B and Donna H! Thank you to all of you that shared your comments in our survey. Thank you for helping us improve your experience in our office. If ending a relationship with tobacco is on your list of things to do in 2012, now is a great time to start. You can find helpful advice on how to quit and more about National Non-Smoking Week here. Remember, in addition to your lungs and heart, tobacco use stains your teeth, damages your mouth's soft tissues and increases your chance of developing oral cancer. If quitting is proving more difficult than you anticipated, we may be able to help. Dr. Benedict and team celebrated their pot luck lunch event on November 29, 2011. A fun time was had by all with a lot of good food and a lot of laughter. Between November 1st - December 13th, our team held a food drive to benefit the Northumberland Fare Share Food Bank. Port Hope Dental and Northumberland Fare Share Food Bank would like to thank those who brought the many non-perishable food items that have been donated! 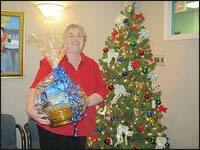 As promised, those who donated a food item were entered to win a Gift Basket from Port Hope Dental. And the winner is... Click here to find out! Dr. Benedict and team shared a wonderful Christmas lunch held on December 21, 2011. The Christmas lunch was located at Limestone Steakhouse. It's always nice when our team can get together outside of the office because we love each other's company! Dr. Benedict and team celebrated the holiday season by supporting local children in need through the Giving Tree at Northumberland Mall. Port Hope Dental donated gifts for 2 teenagers, a 16 year old girl, and 15 year old boy. Gifts included, shirts, socks, DVD's & more! It's still the holiday season, hurry before the special ends. The effects of smoking have been the focus of health campaigns for many years now. Campaigns often focus on the lung and heart problems linked to smoking. Dr. Jordan Benedict would like to offer you oral health related reasons to turn your back on tobacco. While the effects of tobacco use on your heart and lungs may be hidden from public view, the effects on your oral health are often as clear as the smile on your face. Being stuck in the dead of winter doesn't mean you can't enjoy a dose of fresh fruits and veggies. What better way is there to do it than with a delicious smoothie? Smoothies are refreshing and energizing first thing in the morning - or any other time of day - and should be packed full of raw organic fruits, vegetables, and superfoods. Drinking a smoothie is the easiest way to absorb a whole bunch of nutrients all at once. They are full of fibre and vitamins and, depending on what you put into it, you can also get your daily dose of protein, antioxidants, and healthy fats. Click here for the recipe and some tips on how to make the perfect smoothie!